DePorter became famous as a Cubs fan while he ran Harry Caray’s restaurant in Chicago. His first famous move was hosting a Toast to Harry every year on his birthday. In 2003, he attained national recognition when he bought the famous “Bartman ball” at auction for over $100,000. He destroyed it live on television to help remove the curse. In 2008, he co-wrote the book “Hoodoo: Unraveling the 100-year-old Mystery of the Chicago Cubs”. He was Public Enemy #1–so hounded and hunted by the FBI that he underwent drastic plastic surgery to change his appearance. The surgery left him disfigured, but didn’t do a very good job of disguising his appearance. Other bank robbers and gangsters tended to lay low while they were “on the lam,” but die-hard Cubs fan Dillinger couldn’t stay away from Wrigley Field. In the weeks before he was shot, in June and July of 1934, Dillinger attended several games. He went to Wrigley on June 8th, and again on June 26th. He was convinced his new face was fooling everyone. 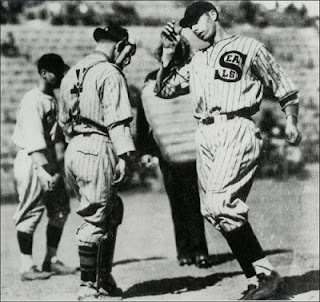 At that June 26th game against the Brooklyn Dodgers, a fan in the stands (Robert Volk from Crown Point) couldn’t keep his eyes off the man sitting two seats away from him. There was something familiar about him, but he just couldn’t put his finger on it. Was it possible? Was that…no, it couldn’t be. It looked like it could have been him. He introduced himself to the man, who shook his hand and introduced himself as Jimmy Lawrence. A reward was being offered for Dillinger’s capture dead or alive, so Volk considered turning him in, but he couldn’t be sure. Would John Dillinger really take a chance by going to a Cubs game? Nah, it couldn’t be him. On July 8th Dillinger went to his final Cubs game. Jim Weaver was on the mound for the Cubs. He was the fifth starter on the team that year, an 11-game winner at season’s end. But it wasn’t the Cubs pitching that drew fans to the ballpark that year; it was their hitting. Future Hall of Famers KiKi Cuyler and Gabby Hartnett paced the most feared offense in the league. They pounded the Pirates that day, 12-3. The next day the Cubs left on their longest road trip of the season. They were only three games out of first place on July 22, 1934. (Photo: The Biograph in 1934) That afternoon they played an extra inning game against the Phillies in Philadelphia. Dillinger probably didn’t know that the Cubs had blown it in the bottom of the 12th inning because he was in one of the only cool places in Chicago–the Biograph Theater. He was watching the movie “Manhattan Melodrama” with his girlfriend. When he emerged from the theater and back into the scorching heat (it was over 90 degrees that day), he felt a different kind of heat. FBI Agent Purvis related what happened next. “I was about three feet to the left and a little to the rear of him. I was very nervous; it must have been a squeaky voice that called out, ‘Stick ’em up, Johnnie, we have you surrounded. 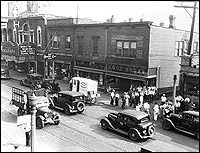 '” Dillinger ran to the alley and allegedly reached for his gun, but he was cut down quickly by the agents on the scene. Agent Purvis was among the first ones to examine the body. “Probably I will never forget, although I would like to, the morbidness displayed by the people who gathered around the shooting. Craning necks of curious persons, women dipping handkerchiefs in Dillinger’s blood. Neighborhood business boomed temporarily. The spot where Dillinger fell became the mecca of morbidly curious.” Cubs fan John Dillinger went to his grave thinking that 1934 might be “the” year for the Cubs. Needless to say, it wasn’t. They ended the season in third place, eight games out of first. He was never a member of the Chicago Cubs, but he could have been. That’s right: The Chicago Cubs passed on Joe DiMaggio. Is there anything that sums up a bad century better than that sentence? The sad part of the story is that it was even worse than it sounds. In the off-season between the 1934 and 1935 seasons, the Chicago Cubs were offered Joe DiMaggio by his minor league team, the San Francisco Seals. DiMaggio had a minor knee injury at the time (he banged his knee stepping out of a cab), and the Cubs were scared off by that injury. They didn’t want to commit any money to someone who might have been damaged goods. Understandable, right? It was even understandable to the owner of the Seals. That’s why he upped the offer. He told the Cubs they could have Joe DiMaggio for spring training in 1935, and if he wasn’t 100% recovered, and he wasn’t 100% the player the owner promised he was, the Seals would gladly take him back and refund every dime the Cubs paid for him. P.K. Wrigley had just finished his third season as the owner of the Cubs and thought he understood the game better than his baseball guys. He looked at his outfield (Chuck Klein, KiKi Cuyler, and Augie Galan) and decided that the Cubs didn’t need another outfielder. He passed on the offer. The Yankees did not. They signed him in December of 1934 for $25,000. While it’s true that the Cubs made the World Series in 1935, one of those outfielders Wrigley was counting on (KiKi Cuyler) was released before the season was over. Another one, Augie Galan, was a converted infielder with a weak arm. He made a crucial error in the 1935 World Series that cost the Cubs a game. The third one, Chuck Klein, was traded the following season; 1936. That was DiMaggio’s rookie year with the Yankees. All he did that season was lead the Yankees to a World Series championship. The following year he did it again. In 1938, he not only led the Yankees to the another championship, he beat the Cubs with a ninth inning home run at Wrigley Field to seal Game 2 of the World Series. Before he was through playing in New York, DiMaggio was a 13 time all-star, a nine-time World Series champion, a two-time batting champ, a two-time home run and RBI champ, a three time MVP, and the holder of the all-time hitting streak record of 56 games. Oh, and he married Marilyn Monroe. But at least the Cubs saved $25,000. *When Harry Caray had his stroke in 1987, Tom was one of the celebrities brought into the booth to fill in for him. He was already Harry’s friend at the time. *He has sung “Take Me Out to the Ballgame” more than ten times. *He has spoken openly of the hardship of being a Cubs fan that grew up on the South Side of Chicago (actually Harvey). *He has been on hand to help lead rallies when the Cubs won their division. Now that’s a Cubs fan.